Here is a 60" diameter solid oak spiral staircase with 30 degree treads. It's handrail is a # 237 (2 3/4" x 2 3/8"); balusters are # 338 (1 3/4" sq.) with a spiral twist and two per tread for a 6" spacing. The treads are a # 142 (1 1/2" thick), and the center column is a 5 1/4" diameter with a custom shape. The stair was assembled in our plant per customer specifications then disassembled and packaged for shipment. The finish on the stair was applied by others. Stairways, Inc.'s all wood spiral stairs are second to none. Like our metal spiral staircases, we will build to your specifications - any height, any diameter. This beautiful spiral stair starts with the structure of a solid one piece center column and no stacking sections. There are many baluster and handrail options to customize the appearance to your taste and decorating style. 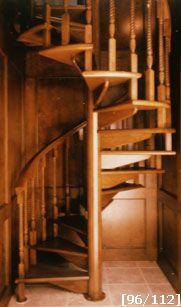 All wood spiral stairs are produced in red oak, although Stairways, Inc. will mill and produce all wood spiral staircases in any species of wood you request. Perfect for libraries, studies, entryways, and living areas. All wood spiral staircases can be designed for a traditional or contemporary feel. Contact Stairways, Inc. for design information and spiral stair pricing.